Dr HH and I just can’t get enough of Berlin. We have abandoned all pretence of going to partake in the cultural and historical side of things – now we can openly admit that we just go there to eat. And eat, we do! In May Dr HH had a rare long weekend off work, so we hopped on a bus on a Friday afternoon and enjoyed a two night stay. On arrival we headed straight for some fast food at Vöner, an all-vegan kebab place. 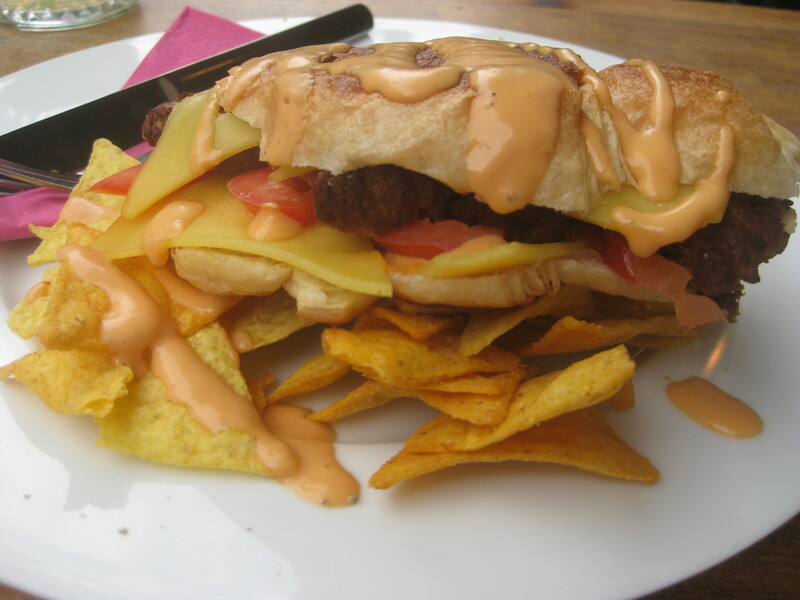 The first time we went to Berlin in 2014 I was too scared to try a vegan kebab. Oh, how times have changed! We didn’t see any paper menus to peruse, so we just used the boards on the wall and as such we panic-ordered. We both chose the vönerteller. I got the tahini-garlic sauce (above) while Dr HH tried tomato-chilli. 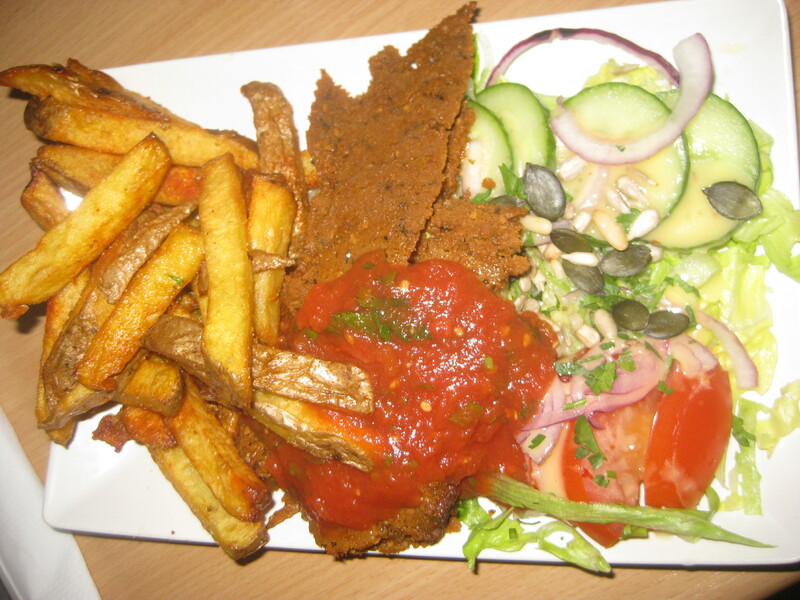 Both plates consisted of some nice but unremarkable salad, some beautifully crispy deep-fried chips and a very generous portion of spicy kebab meat. It was really tasty! The tahini sauce was the better of the two, we concluded (the tomato salsa just wasn’t spicy enough), though there was too much of it for my liking. Some people really like their sauce on the side! 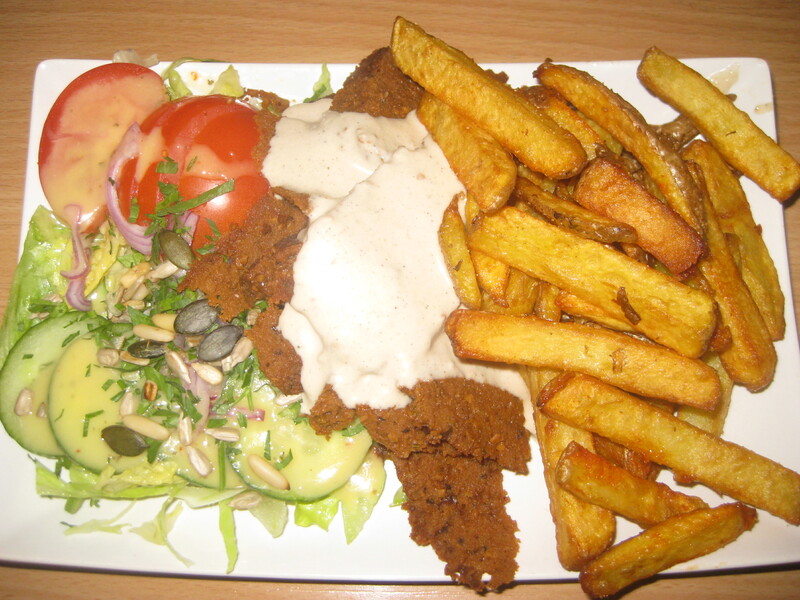 I’d definitely recommend Vöner for the food, and if you’re in the mood for a cheap-and-cheerful kind of place. Service was a little slow for a fast food place, and was also a bit confusing. It was very cramped and busy when we were there (Friday night, so not that surprising), so it wasn’t the kind of place where we could loiter comfortably. 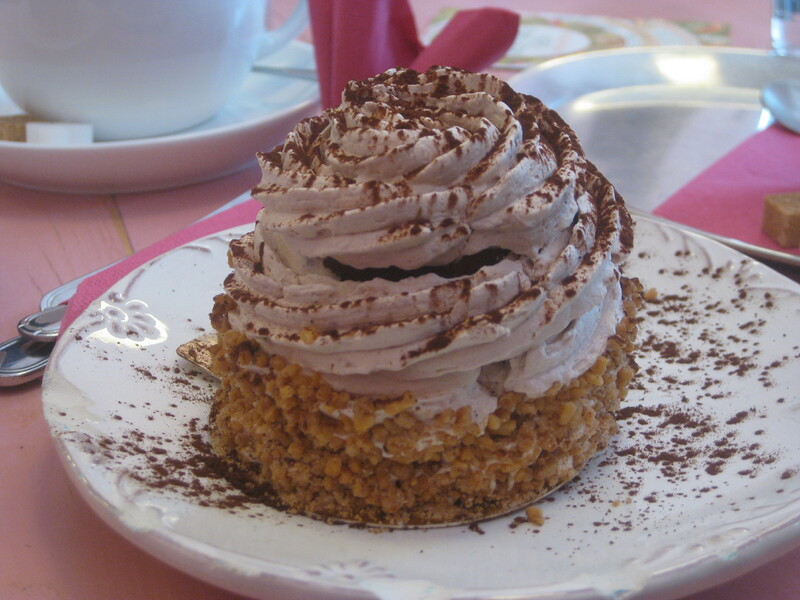 Not that we intended to loiter – I had handily planned things so that we could have a ten minute walk to our dessert stop, Caramello Eisdiele. It’s a little ice cream parlour with just a few seats indoors and outdoors, and it was doing a roaring trade at about 9:30pm on a warm Friday night. There was a tempting display case of ice creams, and I’d say about 60-70% of them were vegan (all clearly marked). The cones are also vegan, which is a huge bonus. 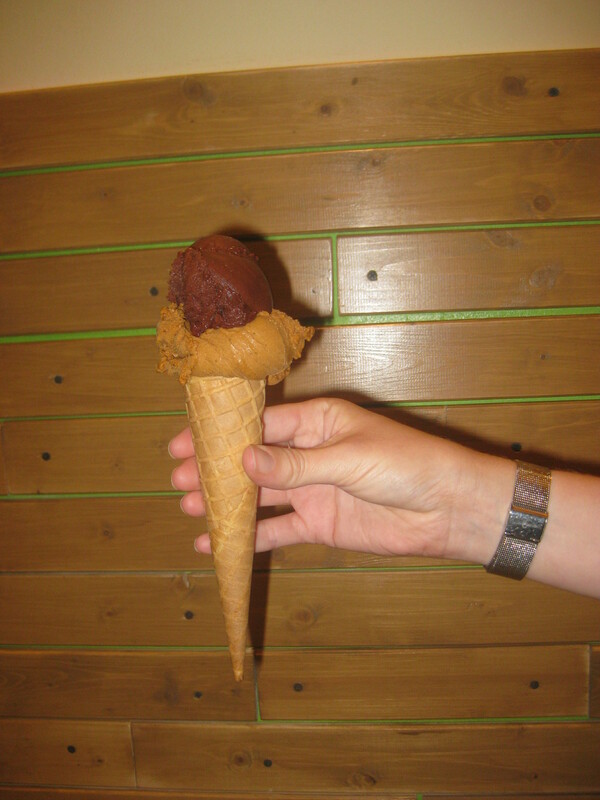 There is a selection of sundae options which can all be veganised, but we couldn’t resist a cone. I had the caramello cinnamon scoop, which was just like eating Biscoff, topped with a scoop of chocolate rice milk ice cream, which was rich and creamy. They worked really well together. As a bonus, the staff were really lovely and friendly. We toyed with the idea of going back on Sunday but, as you will see, more indulgences really weren’t necessary. When booking this trip, our first choice Airbnb turned us down because of changes in the law about renting and our second choice cancelled the booking because he was going on holiday that weekend as well. 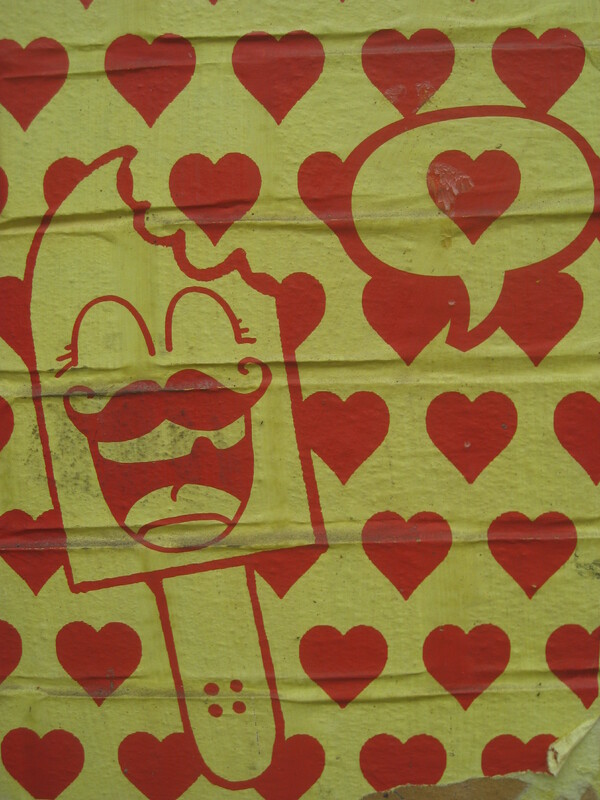 So our third choice wasn’t in the neighbourhood we usually go for (Neukölln), and we were a little anxious. It turned out to be a really good choice though. 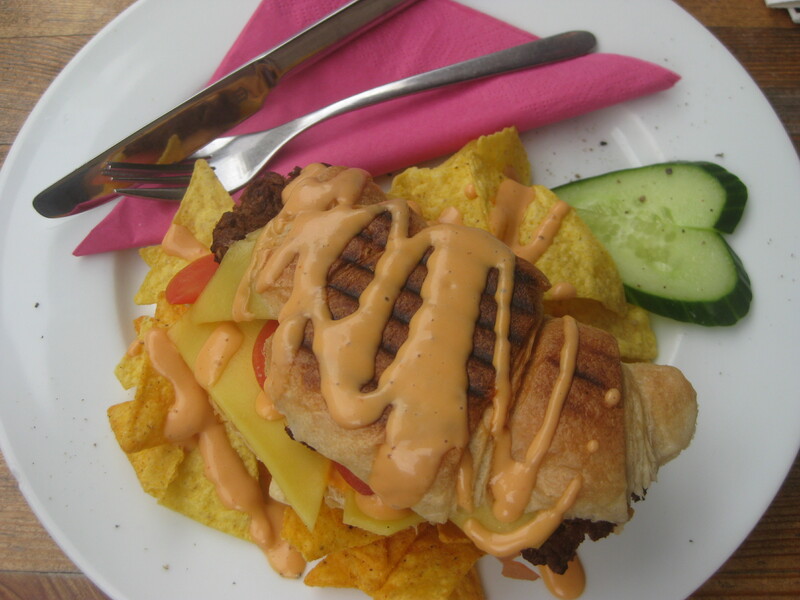 When we checked in and got on the wifi, I had a quick look on the Happy Cow app to see if any vegan eateries were nearby, and that is how we chose our Saturday morning breakfast spot, Die Leckereienfabrik. It’s just as well our top choices cancelled on us, because this was a great find and I doubt we would have stumbled upon it otherwise. First of all, it opens at 9am. This is a rarity: most vegan places in Berlin start serving breakfast at 10am at the earliest, and I just can’t wait that long. It was a really cute, quaint little place with mismatched furniture, vintage crockery, a tempting display of baked goods, and outdoor seating. We ordered the breakfast plate for two and basked in the sunshine while we waited. It was quite the spread! Everything was homemade, and the server described the dishes before we tucked in. As well as the bread basket (four types, including beetroot, all made from spelt flour), we had all these little things to try. There were some marinated mushrooms and sun-dried tomato antipasti, and six tasty slices of salami. 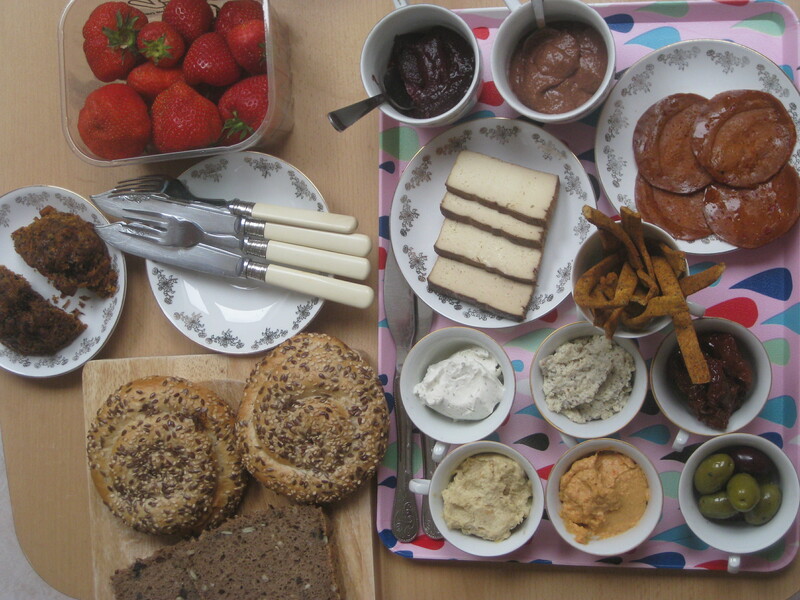 At the top are three cheesy spreads: a cream cheese with seedy crackers, quite a strong cheese with radishes (Dr HH, who still eats dairy cheese occasionally, was especially impressed with this one) and a garlicky herb spread, which was my favourite. In the middle is a well-seasoned tofu scramble with courgettes and peppers, and below it there’s a seaweed spread with sprouts and an egg salad which was creamy and good. The three on the right are the sweet options, so we saved them until the end. The bright orange one is paprika and lemon – it was quite sharp, and also tasted of vanilla. In the middle is a chocolate and blackberry jam which was sublime. 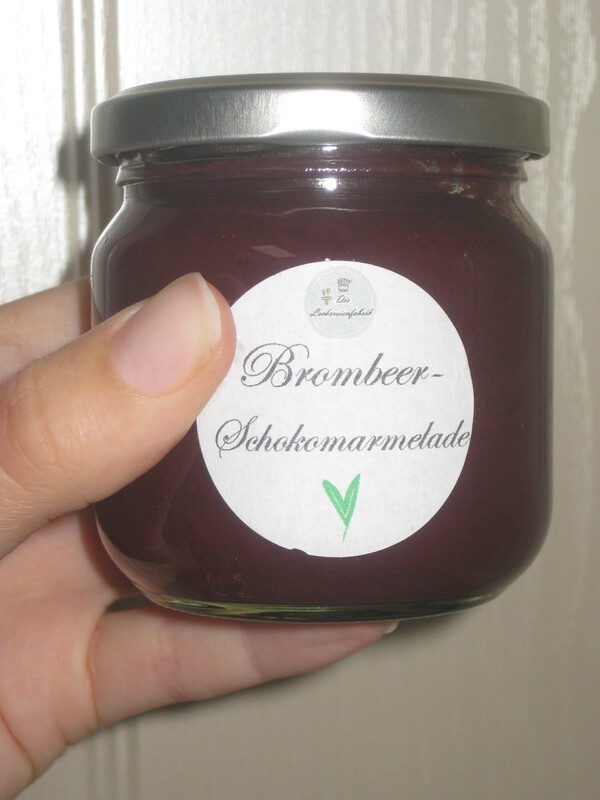 We even bought a jar of it to bring home. And at the top there are two cashew creams, one mango and one chocolate. They were both creamy and delicious. I can’t recommend this place highly enough, I absolutely loved it. Besides a couple of people popping in for a coffee, we were the only customers. It’s a shame, because it should really be doing a roaring trade. This was one of the best breakfasts I’ve ever had! Dr HH and I immediately started fantasising about how to recreate it at home, and you can see the spread I put together last Saturday morning. Not too shabby – but certainly not all homemade! Unsurprisingly, this kept us going for a while and we didn’t need lunch. We ploughed on until it was time for our traditional mid-afternoon trip to Oh La La. As always, we split one tresor and one new treat. If you’re going to call something a Bounty cake, it had better be coconutty. Alas, this wasn’t as flavoursome as it should have been. 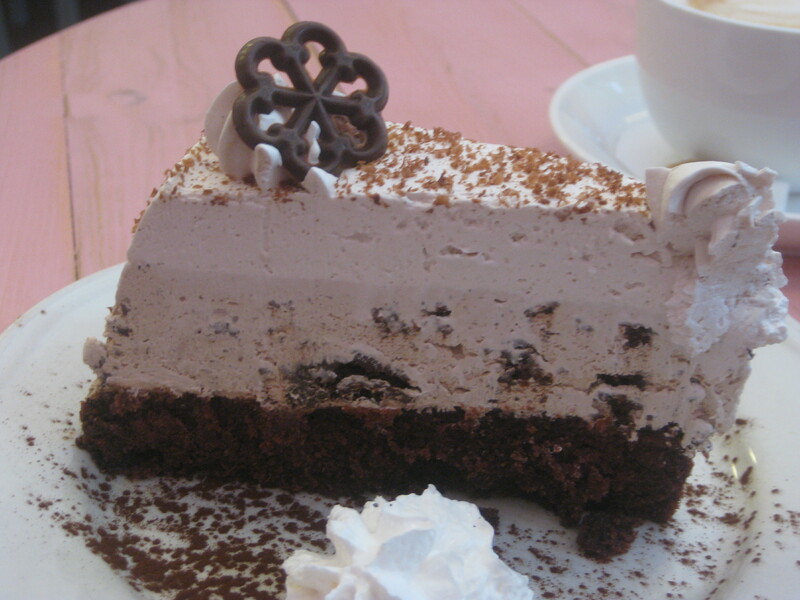 Still, the brownie layer was nice, and you can’t argue with that much cream. It was nice, but it wasn’t mind-blowing. The tresor was divine. Of course. I also treated myself to one of their t-shirts because I’ve spent the months since our last visit regretting the fact that I hadn’t already done so. It’s so pretty! I also bought a drawstring bag with the same design and had to repeatedly reassure Dr HH that I will not wear the two together. We still didn’t need a big meal in the evening, so it was quite a light dinner. Chaostheorie has been on my list for a while, and I was happy to give it a try ,though ultimately it wasn’t my favourite place. It’s all vegan and is more of a bar than a cafe, which is never my favourite thing. We sat outside again, and the inside looked dark but spacious. 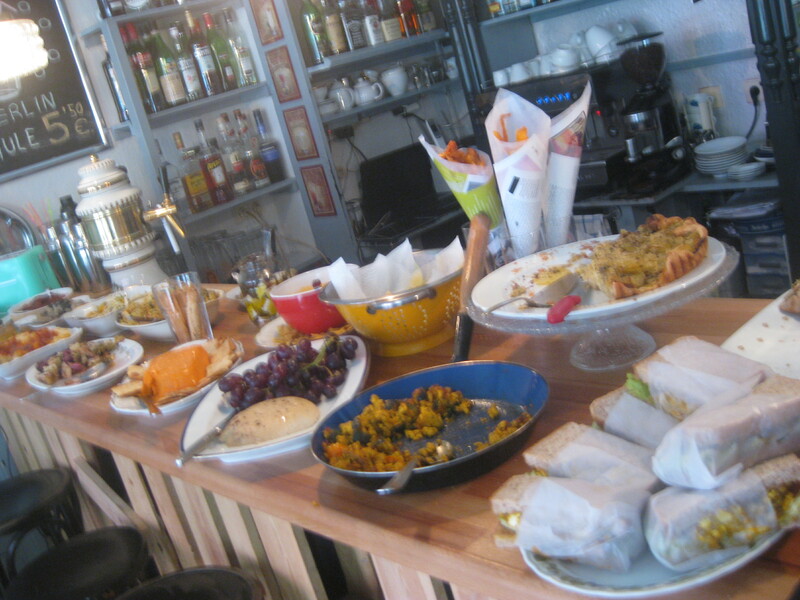 The menu focusses on sandwiches and croissants. I ordered the meatball and cheese croissant, and Dr HH had the same but with added peanut butter. Most importantly, the croissant itself was delicious: flaky and perfect. The meatballs were nice and spicy, and the cheese was inoffensive, though I wish it had melted. I also wish the whole thing hadn’t been drizzled in sauce. I can’t be the only person in the world who likes their food on the dry side! Dr HH also enjoyed his, though he thought the peanut butter overwhelmed the other flavours. We were tempted to ask for a whole bag of croissants to take away with us, but decided against it. They also serve tresors, cupcakes and sweet croissants, but we really didn’t have room. Chasotheorie is cheap and cheerful, and if you’re looking for cocktails it definitely seems like the place to go. Personally, I prefer cutesy little cafes, so it just wasn’t quite right for me but I’m glad we went. Also, there’s a disco ball in the toilet, and the taps are shaped like a unicorn’s head. Always a bonus. 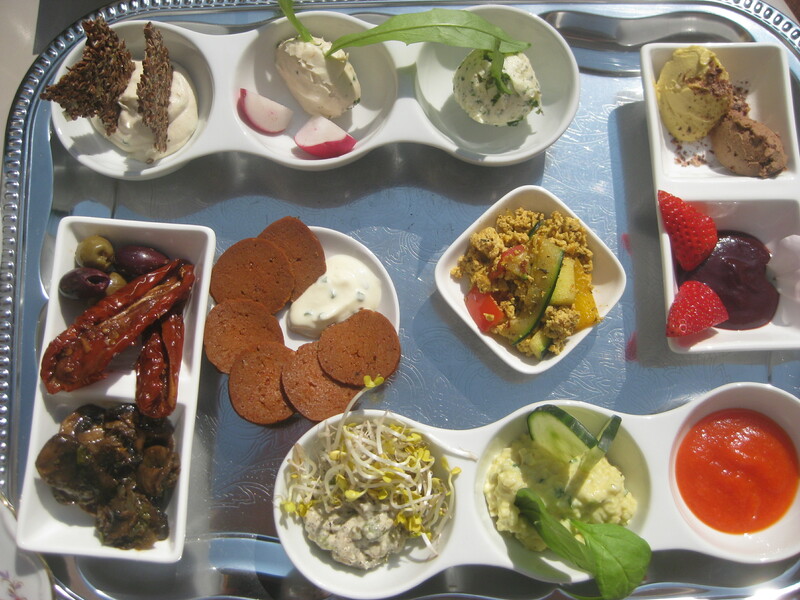 Berlin is not lacking in options for all-you-can-eat vegan brunch (this is an area in which Prague could really stand to improve). I chose Alaska Bar for Sunday morning, mostly because it serves a “deluxe” brunch, and I enjoy that kind of fancy talk. Last time we went to Kopps, which was insanely busy. Alaska was well-frequented, but much more relaxed. The food was up at the bar, and for 12.50 you could help yourself. There were tables outside, but in a futile bid to escape the pollen we stayed inside this time (stupid allergies!). Again, there was mismatched furniture and it all looked great. We certainly got our money’s worth! There was lots to try, and it was replenished regularly. The club sandwich was the highlight, filled with grilled vegetables and pesto. The crispy wonton-style parcel of spinach and creamy tofu was also excellent. We also tried the stuffed vine leaves, a tasty scramble and some tomato/aubergine/olive antipasti. Then we had another club sandwich and another wonton. 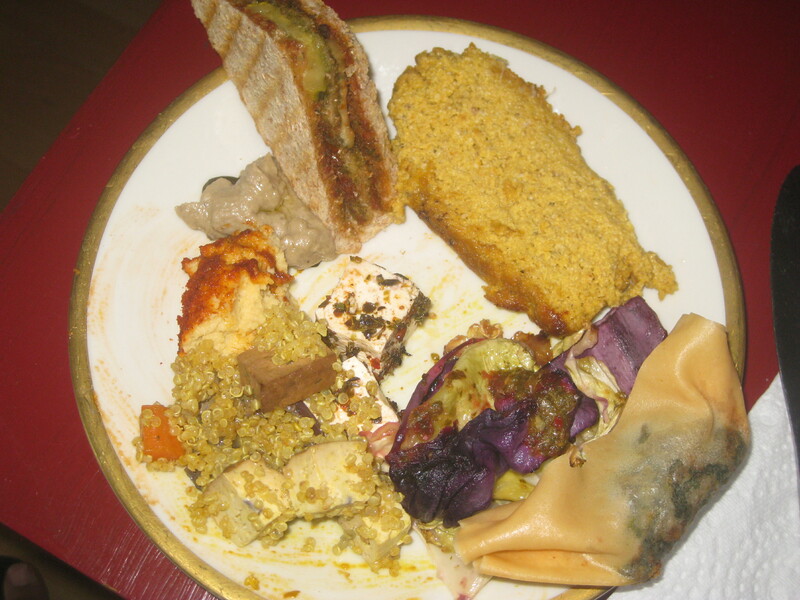 Also, some yellow loaf that was actually more of a spread, a cabbage salad (that splash of purple there), and some giant couscous with smoky tofu and some hummus. Also, very excitingly, a cube of feta-style tofu! It was really good, and once again got the approval of Dr HH. 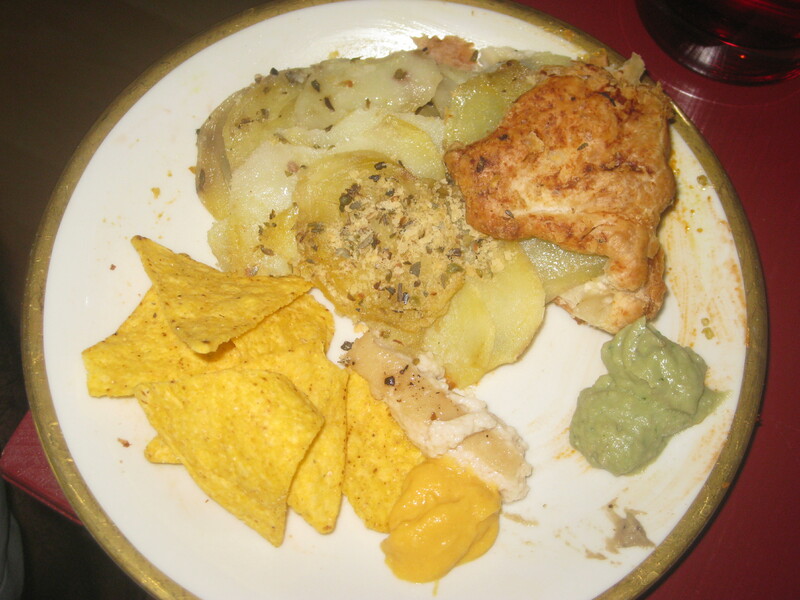 And we also had a slice of herby potato tart (the pastry was perfect and I loved it, but Dr HH thought it too dry), some nachos with cheesy dip and some creamy guacamole. 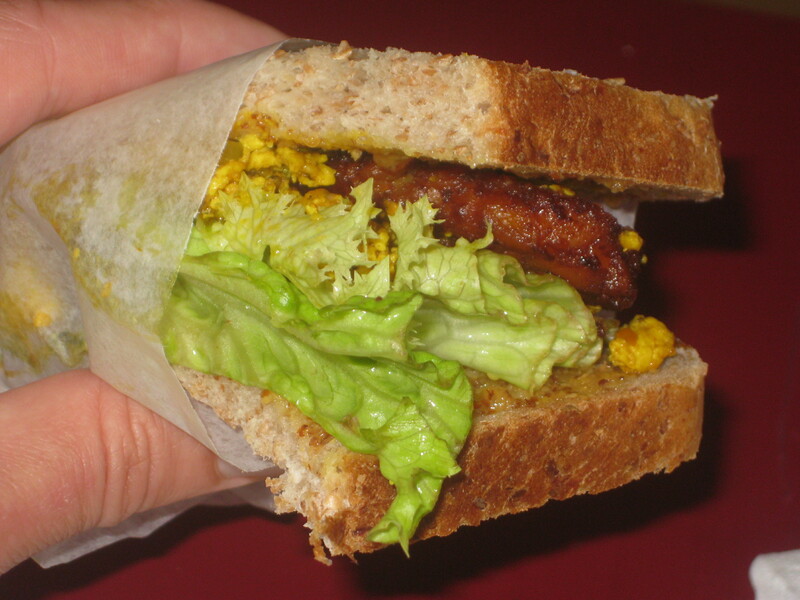 And we shared one of these ‘bacon and egg’ sandwiches, which were very quickly devoured by the crowds. 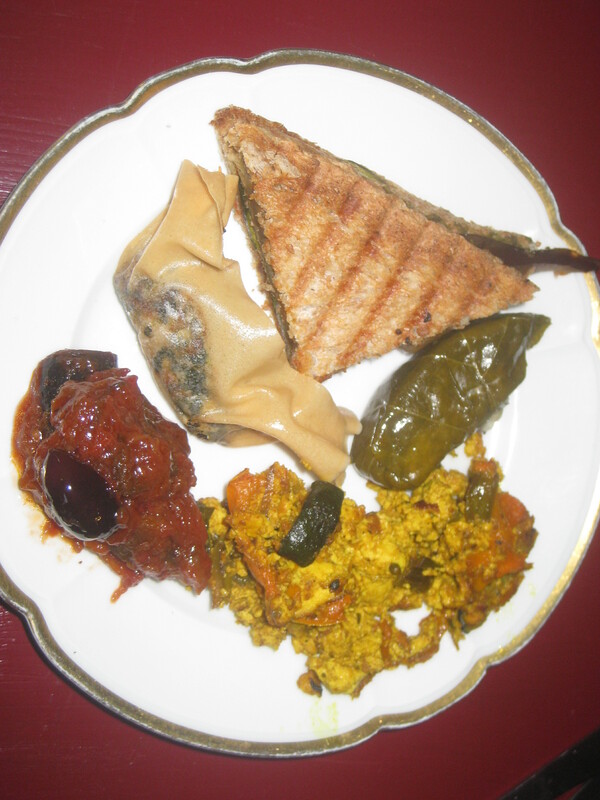 I enjoyed the tempeh bacon and the tofu scramble, but found the dressing a bit too sweet, which was a shame. That was enough to fill us. There was also cereal, fruit, bread buns and a cheesecake, but we didn’t fancy those. We saw some other patrons ordering churros (not as part of the brunch), and couldn’t resist. How often do you get to eat churros? So this was our brunch dessert. 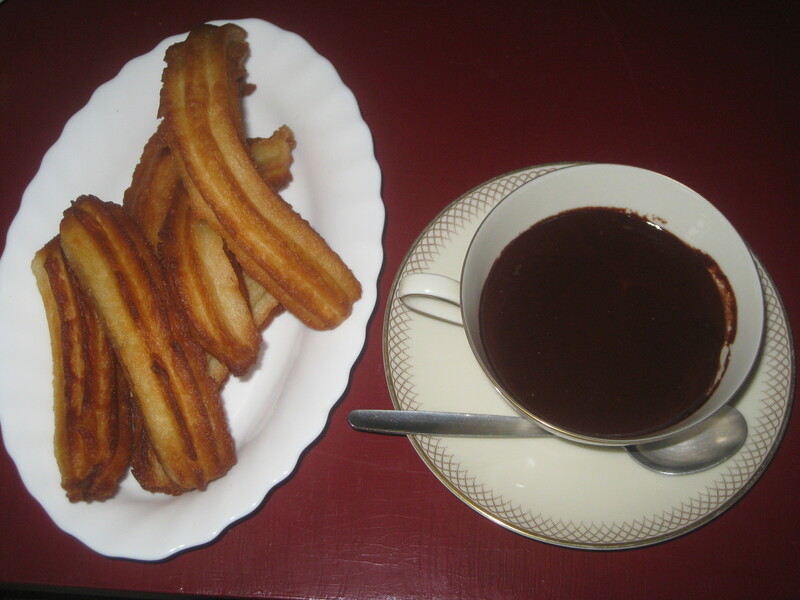 They were exactly as churros should be, and the chocolate was rich and delicious. (Alaska serves tapas in the evenings, it has a really Spanish feel). 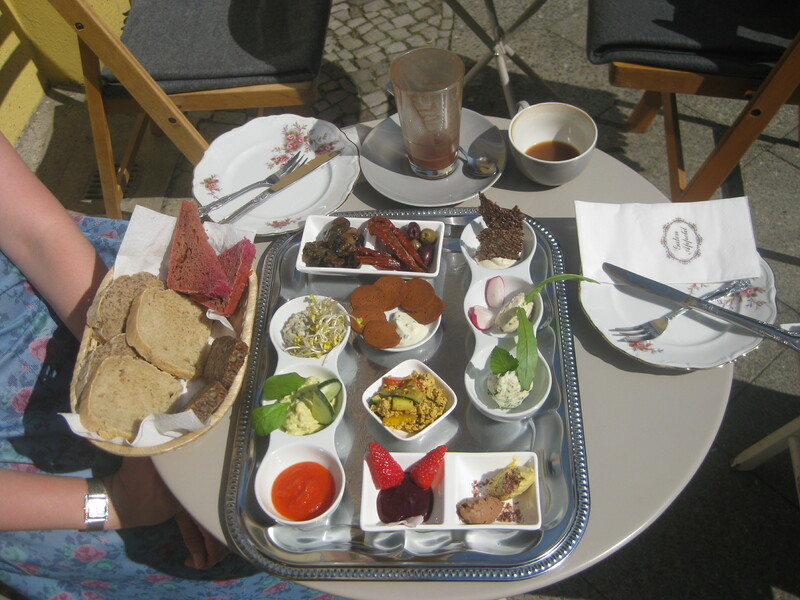 Definitely try this place for your next Berlin brunch! There was just time to grab some more fried dough before hopping on the bus back to Prague. 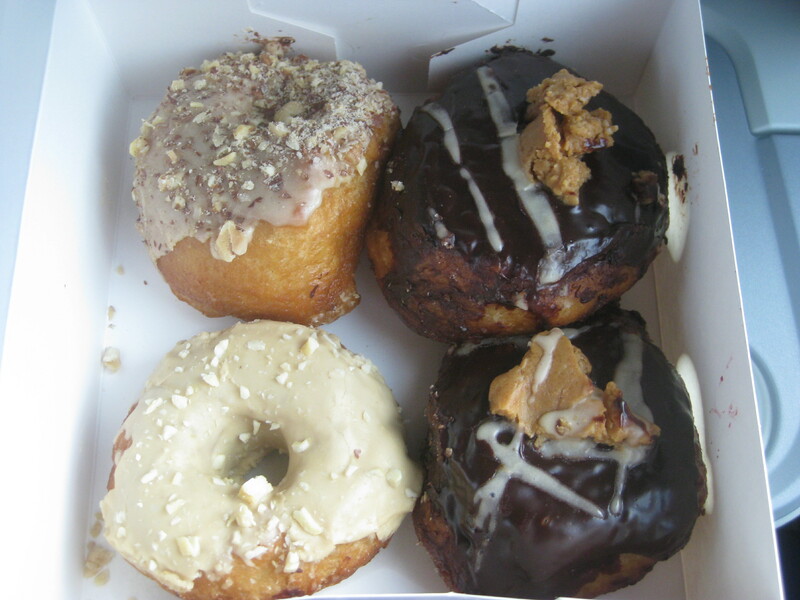 While we were in Oh La La on Saturday, Dr HH had picked up a leaflet for an all vegan donut place within walking distance from Alaska, so off we went. We picked up a box of four donuts to take on the bus. Brammibal’s is a nice place by the river, with indoor and outdoor seating. It also serves bagels, but we only had eyes for the donuts. There were about 8 varieties and we agonised for a while before choosing. We didn’t need any other meals after Sunday brunch, but we ate the ring donuts on the bus ride home. I had the speculoos one in the bottom left corner. It was sweet and nice, but didn’t really taste of speculoos. Dr HH had the nutty one above it, which was the better of the two. We saved the chocolate peanut butter fudge ones for Monday night while watching Game of Thrones. We’d expected a gooey centre, but alas they were not filled. They were nice, but didn’t quite live up to our expectations. Still, vegan donuts are a rarity/non-existent in Prague, so it was nice to have some for a change. And that was that! We returned extremely well-fed and happy, and dreaming about our next visit. This entry was posted in Travel and tagged Alaska Bar Berlin, Brammibal's Berlin, Caramello Eisdiele Berlin, Chaostheorie Berlin, Leckereienfabrik Berlin, Oh La La Berlin, vegan, vegan Berlin, vegan travel, Voner Berlin. Bookmark the permalink. I reeeeeally want that Oh La La shirt! So cute! I looove the croissants at Chaostheorie and I’m a big fan of the chips at Voner… you’re making me want to re-visit Berlin again! I was actually fantasising about the chips all the way through my lesson this morning! It’s hard to find good chips sometimes. 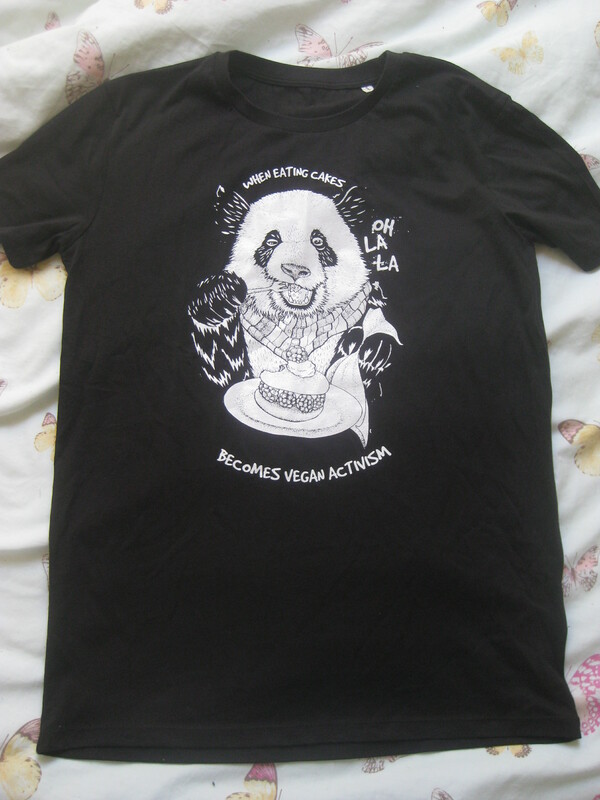 I really regretted not buying the t-shirt the first time I saw it, so I’m especially happy to have snaffled it now. It’s good quality too, so I’d recommend it if you can work your way there on your travels. I wish I could find another excuse to get to Berlin, purely for the food (though the city is interesting of course, I can’t go on holiday without thinking about all the food I’m going to eat!) I love the ice creams and the breakfast. I’m with you about the waiting til 10am thing though! Food is always the main attraction! We’re going to Spain in a couple of weeks and I’m extremely concerned about their opening hours. They do not match my ideas of meal times! Oh my goodness! There is so much amazing food in this post my mouth is actually watering. Berlin seems to go from strength to strength with their vegan food offer which is brilliant to see. Looking back, it was definitely a lot to consume in one weekend! Totally worth it though. We’ve been to Berlin three times now and always eaten at different places (except for Oh La La, which we can’t resist), which goes to show how many vegan options there are.